Collecting her 2013 E.P. 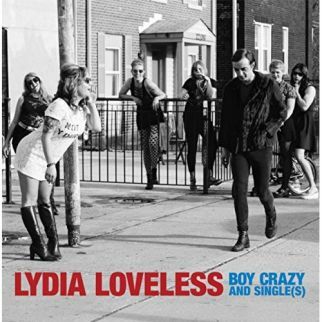 (Boy Crazy), a few vinyl-only singles, and a few cover song B-sides, Lydia Loveless presents Boy Crazy and Single(s), her latest release. The recordings span the period of 2012 through 2015. Backing a 7” single from her Indestructible Machine album (“Bad Way to Go”), Lydia Loveless offers the B-side from the 2012 release with “Alison”, laying the Elvis Costello tune out with vocals over the raw strums of an electric guitar. Record Store Day 2014 saw a two-sided release on lime green vinyl, with Boy Crazy and Single(s) apologizing for ‘the All-American noise’ on A-side “Mile High” as it covers Kesha on the B-side with an emotional take on “Blind”. Lydia Loveless partnered with Bloodshot Records labelmate Cory Branan for a 7” vinyl tribute to The Purple One as each artist took on a Prince track, Boy Crazy and Single(s) hosting Lydia’s version of “I Would Die for You”. For the original release of the E.P. 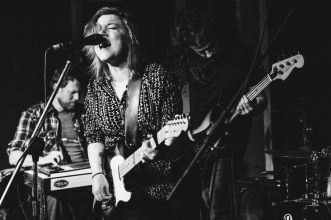 Boy Crazy in 2013, Lydia Loveless gave the back story for the recording as ‘we rehearsed for about a week and then went into the studio with a couple thirty packs and knocked it out. It's my rock and roll tribute to baseball pants and youth’. All five tracks from the E.P. are collected and spread out as Lydia Loveless cruises in on equal parts guitar jangle and crunch to dub herself “Boy Crazy”, listing all the reasons that she would ‘give everything up for a night with that’. Boy Crazy and Single(s) tenderly dips its toes in Classic Country for “The Water”, soundtracks a “Lovers Spat” with a rock’n’roll beat, and shakes up a rhythm for the confessions of “All the Time” as Lydia Loveless opens the album with late-night memories in “All I Know”.